Insulate under your house or camp. It is a hot, hot, HOT time to try spray on thermo insulaton to sop the heat. 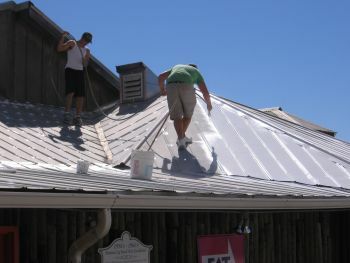 We fix almost any type of roof(flat, tin, shingle, and many others). A/C or heating can't keep up?? Insulation problems?? Is your roof damaged or leaking and gets too hot or cold?? We may have the answer! We guarantee about a 20% drop in your energy bill instantly with our Thermal Ceramic Insulation Coating product. This Latex Ceramic coating can be sprayed on almost any surface. Prefer coating on the underside of your roof or the top? We do either. Inside or outside walls; blocks tin, wood, brick, or stuco. We can spray on top most old paints, under floors, on raised buildings and camps ,inside or outside, old coolers and freezers. We can insulate them back to new specks or better. Do you have a porch that's just too hot to sit under? We can help cool it down! Shops, mobile homes, camps, on/off water, boats barges, horse stables, warehouses, barns, homes, storage buildings, chicken ranches, parish prisons, churches, almost anything with walls or a roof we can do it! Saving energy one place at a time!! This is not a fly-by-night company. We have been around since 1992. We are accepted by U/L listed, Energy Star Partner, C.R.R.C., Green Building Council, FDA, U.S. Coast Guard, and many more! We also sell to contractors who what to get into coating too! Got a problem or need more info, call or email us today!